The 7.62x54mm cartridge has served many roles in the past and continues to function very well up until today. For 100 USD (2014 money), you can own a Russian Mosin-Nagant rifle which fires the 7.62x54mm cartridge. That gives you the ability to hunt up to medium game animals, shoot cheaply for training and fun and to defend yourself at distances up to 600 yards. The ballistics of this cartridge are identical to the 308 Winchester. There is a disturbing trend among people to equate a low price with low quality. While this is always the case for newly-manufactured goods, it is instructive to consider the reason why Mosin Nagant and other surplus 7.62x54mm rifles are being sold for such low prices. The real reason is that trends in warfare and the defense environment change the roles of certain equipment and makes other pieces of equipment irrelevant. Armies continually mothball and then reintroduce weapons like the flamethrower, for instance, depending on the tactical situation in the areas in which their military is operating. Countries who do not have the ability to print the worlds reserve currency (the US Dollar), which would then mean all countries other than the United States, have to maintain a much more realistic trade balance and military budget. This means that when equipment is serviceable but ‘obsolete’ for your countries needs, you can sell it at a good price and use the money to buy newer, more relevant, equipment. Such is the case of the wonderful weapons that can be purchased from the Eastern Bloc as surplus. I’m on record as being an admirer of the ’Russian’ way of engineering most pieces of equipment. Simple, well thought-out and practical are all words that spring to mind. If you are interested in the 7.62x54mm cartridge, you can buy a Mosin Nagant (bolt action rifle), a Dragunov (semi-automatic sniper rifle) or even a Winchester Model 1895 lever action in this caliber. If things go way south where you are, the PK is the Eastern Block equivalent of the M60 “light” machinegun and has been proven in combat the world over. “But it’s only a bolt action” I hear people hiss. The truly humorous part about all this is that such people can’t hit their target with a semi-automatic either and they will then blame the equipment on their personal failure. No one is born being able to shoot proficiently but some get better faster and some retain the ability longer than others. The key is practice and practice is often boring. So you have to decide what kind of threat level you face in life and then spend the appropriate amount of time training to confront those future possibilities. Just between you, me, and whoever else is listening—I am a marginal shot at best with a rifle. With a Mosin Nagant rifle, open sights, and military surplus ammunition, I was able to hit steel silhouette targets 2/3 times at 200 yards. I was firing from a sitting (on the ground, not on a bench) position and scoring those hits. Rate of fire does become an issue in close quarters combat. This is where bolt action rifles are not as desirable. If the other side has any clue as to what they are doing, there will be lots of moving targets and brief exposures from behind cover. This means that many misses of the target will occur and much ammunition will be consumed. On the other hand, its important to know that if you hit your attacker ’on the numbers’ with a good 7.62x54mm softpoint—they will not pose much of a threat to you for long. It begs the question: “are multiple bad shots (SMGs and carbines) better than one well-placed shot?” Only you can judge this for yourself. We have no further to look than Finland in the 1940s to find an example of what one man can do with a bolt action rifle, training and balls the size of grapefruits. 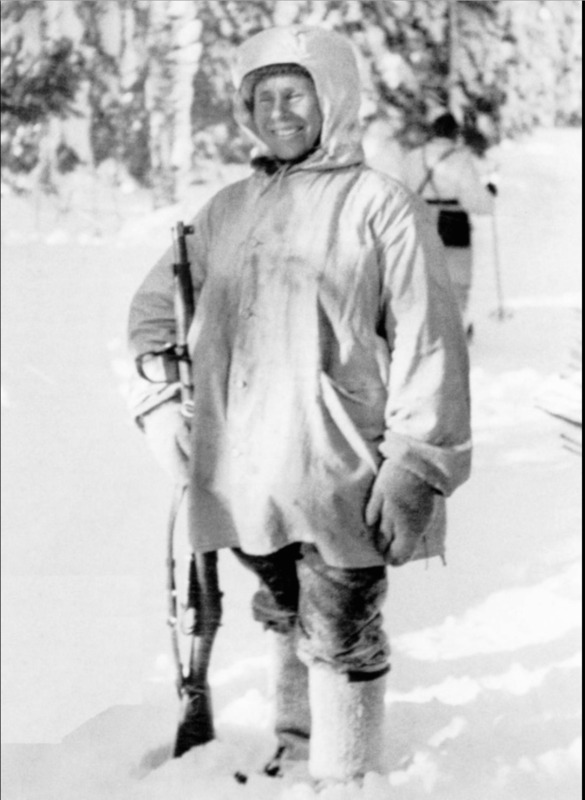 Simo Häyhä was a Finnish sniper who was armed with a (presumably) accurized Mosin Nagant rifle. He did not use a scope because it put his head up higher than the iron sights. This would increase his visibility to the enemy and would increase his exposure to incoming fire. If Simo could do it with ‘only’ a Mosin Nagant, you cannot blame your much more modern and more expensive equipment for missing the target. Dragunov sniper rifle is shown in Figure 2. It is the Eastern Bloc equivalent of the M40 (accurized M14) and is said to be effective out to 800m. On a dollar-for-dollar basis, you get a less accurate rifle for your money when you buy an ‘accurized’ semi-automatic rifle. There are three elements to precision shooting: the precision of the firearm, the ability of the shooter and the precision of the ammunition. Two of those you can buy at a store, the other you have to earn. What drives the precision of a firearm is its ‘repeatability’ which is best expressed as ‘having the parts located in the same place each time you pull the trigger.’ Repeating actions require an increased space between parts in order to function reliably in anything but the cleanest environment. Bolt action rifles are driven by the strength of your arm and can have tighter tolerances to allow for greater precision. This is not to say that there are no accurate semi-auto rifles—it is to say that you will have to pay a handsome amount to have a qualified gunsmith accurize all of those moving parts. A great semi-auto rifle can shoot sub-1” groups at 100 yards. A great bolt action rifle can shoot 0.6”—0.7” groups at 100 yards. Ammunition selection for the 7.62x54mm is simple—soft points for hunting and self-defense and FMJs for practice. It is fair to assume that military surplus rounds have corrosive primers—as such you will need to be ready with ammonia or any other cleaning agent that is used for corrosive primers. Elsewise your gun will be corroded and will eventually experience parts failures. There are military-issue armor piercing loads available for the 7.62x54mm and I recommend strongly that you obtain those if you can do so in a legitimate manner.